Innovative axial low-noise and energy-saving fan for exhaust ventilation with air capacity up to 370 m3/h. Mounting into ventilation shafts or connection to Ø 100, 125, 150 mm. Innovative exhaust fan with stylish design for new comfort level in shower rooms, bathrooms, kitchens and other residential premises. Maximum air capacity combined with low noise level provide the ideal microclimate. Mounting into ventilation shafts or connection to Ø100, 125, 150 mm. Casing and impeller made of high-quality and durable UV-resistant plastic. Specially designed impeller aerodynamic profile provides high air capacity and low noise. The compact design enables wall and ceiling mounting. The shortened spigot for mounting into a ventilation shaft or connection to Ø 100, 125, 150 mm air ducts. The fan is equipped with a specially designed back valve to prevent back flow and heat losses during the fan standby. The fan exhaust spigot incorporates specially designed air rectifiers to reduce air turbulence, increase air pressure and lower noise level. High ingress protection rating ensures makes the fan the ideal solution for ventilation of a bathroom. The electronic components are protected with tight covers. Models VENTS 150 Quiet and VENTS 150 Quiet Extra are additionaly equipped with a special vibration absorbing sealer along the fan countour. Low energy demand from 7.5 W due to new high-efficient motor. Maintenance-free bearings contain enough grease for 40 000 hrs non-stop operation. Motor on special anti-vibration dampers for vibration absorbing and silent operation. Motor equipped with overheating protection. VENTS 150 Quiet supplied with 2 speed motor. VENTS 150 Quiet Extra supplied with 2 speed high powered motor. Operation modes of the fans models VENTS 150 Quiet and VENTS 150 Quiet Extra with modifications T, TH, VT, VTH, TP is selected by setting the DIP switch into the required position. The fan is turned off by default. The fan starts operating at the 1st speed when the switch is closed or one of the sensors is activated. The fan is turned off by default. The fan starts operating at the 2nd speed when the switch is closed or the sensors are activated. The fan operates at the 1st speed by default. The fan switches to the 2nd speed when the switch is closed or the sensors are activated. The fan is turned off by default. The fan starts operating at the 1st speed when the switch is closed and switches to the 2nd speed when the humidity sensor is activated. The fan is turned off by default. The fan starts operating at the 1st speed when the switch is closed or when the humidity sensor is activated. If during the operation at the 1st speed the second even takes place. i.e. the switch is closed or the humidity sensor is activated, the fan switches to the 2nd speed. Manual control with a room light switch. The switch is not included into delivery set. The fan is controlled by the built-in pull cord switch V. Not applied in case of ceiling mounting. Speed control is possible through a thyristor speed controller or through speed switch P2-1-300 (only for VENTS 150 Quiet models), see Electrical Accessories. Several fans may connected to the same controller. Speed controllers can not be connected to the fans with T, TH, TP, VT, VTH modification. By the electronic control unit BU-1-60 ( see Electrical Accessories). The control unit is supplied separately. By the timer T (the built-in run-out timer enables the fan operation within 2 to 30 minutes after the fan switching off). By the humidity sensor and timer TH (if the humidity level in the room exceeds the sensor threshold within 60-90% the fan switches automatically on and operates until the humidity level drops to the standard level, after that the fan continues operating within the set time period and shuts down). By the motion sensor and timer TP (if motion is detected in the reach area, the fan is switched automatically and operates within the set time period from 2 to 30 min). Reach distance up to 4 m, the max. viewing angle 100°. Installation directly inside a ventilation shaft. Flexible air ducts may be used in case of remote location of the ventilation shaft. Connection of the air duct to the exhaust flange with a clamp. Mark of conformity to the European Quality Standards and Electrical Safety issued by Association for Technical Inspection (Technischer Überwachungsverein, Germany). CE mark means that the equipment is produced in compliance with the quality and safety standards provided by EU regulations for the given product type (marked by manufacturer). Mark of conformity to the Polish Quality Standards and electrical safety issued by PCBC (Polish center for testing and certification). Mark of conformity to the Slovak Quality Standards and electrical safety issued by EVPU (Slovakia). 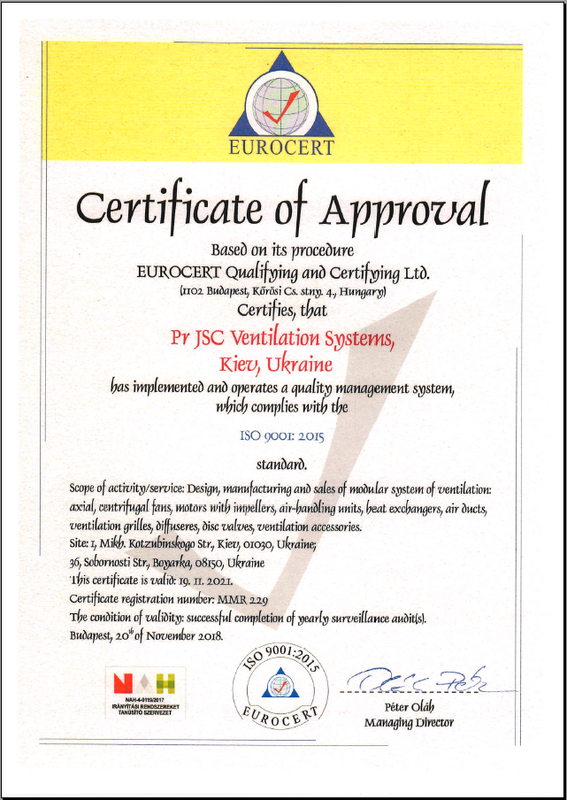 Mark of conformity to the Ukrainian Quality Standards and electrical safety issued by UkrTEST. Mark of conformity of the goods subject to obligatory certification in DSTR system as well as technical norms and standards acting in Russian Federation. Confirmed by the RosTEST certificates (Moscow). Quiet T Off-delay timer modification with operating time from 2 to 30 min. Quiet TH Off-delay timer modification with the operating time from 2 to 30 min and humidity sensor with threshold from 60 to 90%. Quiet V Pull-cord switch modification. Quiet VT Modification with pull-cord switch and off-delay timer with operating time from 2 to 30 min. Quiet VТН Modification with pull-cord switch, off-delay timer with operating time from 2 to 30 min and humidity sensor with threshold from 60 to 90%. Quiet ТР Modification with off-delay timer with operating time from 2 to 30 min and motion sensor; reach distance up to 4 m, viewing angle up to 100°. Models VENTS 150 Quiet with modification T / TP / VT / VTH additionaly supplied with turn-on delay timer adjustable from 0 up to 2 minutes. How often do you use equipment selection program? Regularly. It is my working tool. I do not use it at all.